Two photographers hoping to snap night-time shots near the River Thames were in for a shock when armed police stopped and quizzed them at length on Friday night. Six officers descended on the pair at 8.30pm on 13 March after they were seen taking pictures near the MI6 building in Vauxhall on the south bank of the river. 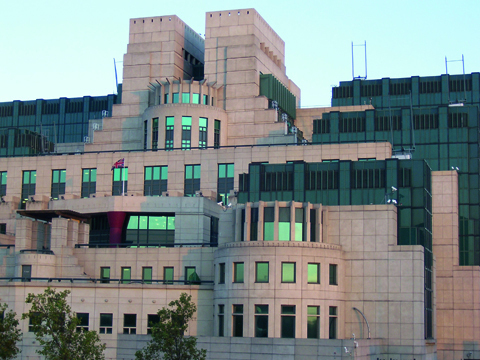 MI6 is the home of Britain?s foreign intelligence service and is regularly patrolled by armed guards and police on motorbikes. Amateur Photographer (AP) news editor Chris Cheesman, who witnessed the incident and lives nearby, said: ?At first there were just two officers, one of whom appeared to be asking to see the images on the young woman?s camera, an enthusiast-level DSLR. She was taking shots from the slipway that leads down to the river, next to MI6. ?Twenty-five or thirty yards away a man, also with a tripod but on the pathway, was being questioned. Minutes later, more police arrived.? Chris, who happened to be walking passed at the time, added: ?Though this is clearly a high security area, it seemed like a complete overreaction for so many police to be involved. This is a publicly accessible location and there are no visible warnings against photography or filming. ?I suspect that if the pair had not been carrying tripods no alert would have been triggered. In the past I have considered using one for long exposure shots, but to avoid attracting unwarranted attention ? and hassle from the authorities ? placed my camera on the river wall instead. But it is sad that photo enthusiasts feel inhibited in this way.? Speaking this morning, a spokesman for the Metropolitan Police said it was likely the pair were stopped under stop-and-search powers, but that it would take several days to trace written records for confirmation of this. He said police computer records suggested no arrests had been made. Anti-terror legislation gives police power to stop and search anyone, whether or not there are grounds to suspect a connection with terrorism. Last week, the Home Office invited AP to help draft guidance that will aim to ensure police do not misuse anti-terrorism legislation to unfairly stop photographers. Counter-terrorism minister Vernon Coaker made the request at a meeting in Parliament in which AP stressed the need for police to adopt a common-sense approach when dealing with photographers. The talks in Parliament followed a nationwide campaign to defend the right to take photos in public places – sparked by growing evidence that police routinely use anti-terror powers to unfairly stop amateurs and professionals taking pictures. ?I am surprised I haven?t seen this type of stop near MI6 more often, given the sensitive nature of the area,? said Chris. ?The bizarre thing is that many tourists probably don?t even realise they are near MI6. And on New Year?s Eve the area in front of the building is packed with revellers ? with cameras ? enjoying the view of the London Eye fireworks, which can be seen in the distance. ?